According to the global cloud encryption market is highly consolidated. A few key players who are well established are holding key market shares. Names of the leading players operating in the cloud encryption market are: Thales e-Security Inc., Sophos Group Plc., CipherCloud Inc., IBM Corporation, Secomba GmbH, Gemalto NV, Hytrust Inc., Symantec Corporation, and Netskope Inc. Key players are indulging in technological innovations to strengthen their foothold and eliminate competition. Companies such as SonicWall Inc have released a range of advanced cloud security products in 2017 including SonicWall Cloud Analytics application for deep security data analysis and automated breach detection. Players are also looking to tap on the markets in emerging nations of Asia Pacific as these nations are rapidly adopting cloud solutions. As per estimates of the TMR report, the global cloud encryption market will be worth US$2,912.3 mn by the end of 2025. The market is expected to showcase an outstanding CAGR of 21.5% between 2017 and 2025. On the basis of service model, the infrastructure as a service (IaaS) segment is expected to lead in the market on account of its various benefits over other service model components. By end user, the Telecom and IT segment are expected to be leading among the key industry verticals. On the basis of geography, North America has been leading in the market for cloud encryption. According to the report, the dire need to encrypt data before it is transferred for storing in the cloud is the primary factor behind the growth of the global cloud encryption market. The rise in the penetration of cloud encryption Solutions is also due to the high demand for security capabilities for cloud storage. The rising adoption of advanced data storage technology and data storage architecture small and medium Enterprises will also fuel the demand for Cloud encryption solutions. This particular Trend regarding the adoption of advanced data storage technology and data storage architecture by small and medium Enterprises is particularly true for emerging Nations such as India, China, and Japan on account of the growing adoption of software-as-a-service distribution model. SMEs are increasingly shifting to Cloud from in-house data centers. This is because of the various applications which help in the saving and managing cost of their data centers. This in turn is expected to bolster the demand for cloud encryption. The growing adoption of infrastructure-as-a-service model as well as software-as-a-service model in developed nations are having a positive bearing on the cloud interruption market. The developing nations are also benefiting from the early adoption of bring your own device practices. 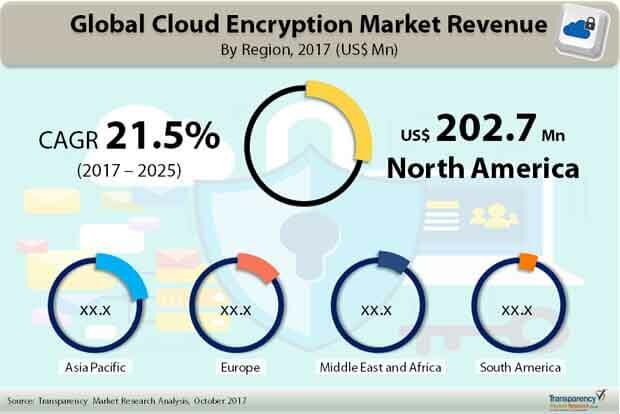 In addition to this advancements in cloud technology in developed nations as well as the demand for private and confidential data will drive the growth of the global cloud encryption solutions market. The growing complexities of it systems and capability to deploy new applications with booster cloud encryption market in developing nations such as india and china. In particular, healthcare and BFSI sectors display substantial demand for cloud encryption solutions due to the growing complexity of IT systems.